Family Friendly Gaming is awesome for purchasing a copy of Baja Edge of Control HD on the PS4. This game is also on the PC, and Xbox One. I have no clue as to why the PR and Marketing for this company failed us so badly. They lost sales by their behavior. Each and every single one of us must take responsibility for our choices. I am pleased that I was given an opportunity to play Baja Edge of Control HD on the Playstation 4. Look for a review of Baja Edge of Control HD in the always awesome Family Friendly Gaming ISSUE NUMBER ONE HUNDRED AND TWENTY-SIX. Can you believe Family Friendly Gaming has created that many issues? Baja Edge of Control HD is a really fun video game. 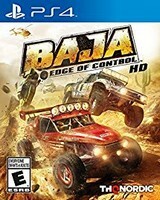 I had a blast racing in Baja Edge of Control HD on the Playstation 4. This is a decent racer game that is not as involved or complex at some other racing games. At the same time Baja Edge of Control HD is approachable by all skillsets within a family. I value Baja Edge of Control HD at twenty to twenty-five dollars brand new. I hope to see more game like Baja Edge of Control HD in the near future. Until the review comes out your family can look this game. Let THQNordic know you purchased Baja Edge of Control HD because of Family Friendly Gaming. They love to hear whose work makes them sales.